If you have got a pump and a PC you will need cables to connect them. Have you got cables? 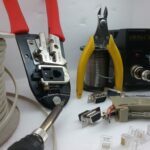 This page will take you to other pages which will help you get cables through purchasing information or DIY cables information. This page contains images of all the official pump related cables. It lists when to use each cable (application) and their official part numbers. You can order these cables from your pump distributor. 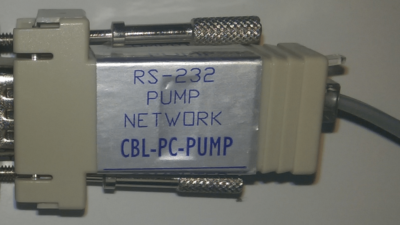 CBL-PC-PUMP is the cable used to connect a pump to your computer. CBL-NET is the cable to connect a daisy chain from the first pump to the second pump, pump n to pump (n+1). The quick answer is from your pump distributor. Find your pump distributor. Hey tell ’em SyringePumpPro sent you. Don’t know what to order? The part numbers are on this diagram. The CBL-PC pictured here should definitely be on your shopping list along with a USB-RS232 adapter. Here is the manual for that cable. 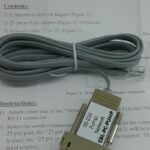 Thinking of simply buying some generic RS-232 cables? Don’t. Take care I regularly see folks struggling with bought cables and then purchasing the pump manufacturer cables in the end. I have photos of a the handy-work of one frustrated general serial cable purchaser – it reveals hacksaw cutting on a cable end – ugly! Bought cables are inexpensive and will save you time, simply because they will work properly and leave you in no doubt that the cables are the correct ones. What are all the different cables/ what are they used for? There’s a table showing each cable and describing it’s use here. 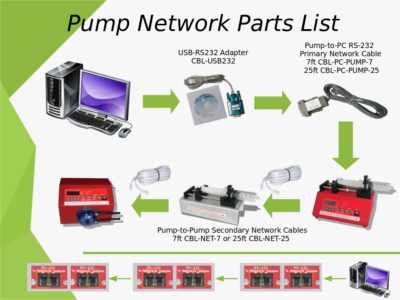 Do you need a power supply for your pump?